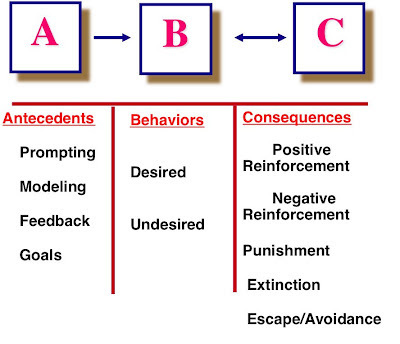 The Basics: Operant Conditioning - I Love ABA! To be strong in statistics, it’s important to understand basic math skills. To be a skilled driver, it’s important to understand basic safety rules of the road. To become a 5 star chef, it’s pretty important to know how to boil water and peel a potato. Similarly, to be a knowledgeable and qualified ABA professional it’s important to understand the basics of Applied Behavior Analysis: Operant Conditioning. It's quite possible to work in this field and have a minimal understanding of the science of ABA. Expertly written behavior plans and programs can be implemented by almost anyone. 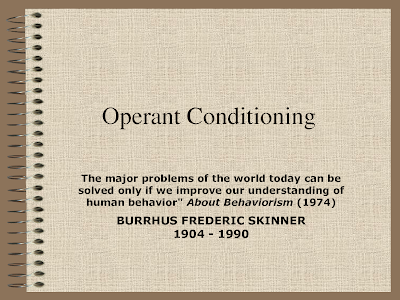 However, if you are serious about this field then a solid understanding of operant conditioning is a must. The difference between being good or great at ABA is often a strong understanding of the science of ABA. If you have ever taken an Intro to Psychology college course, then you likely remember learning about Pavlov and Skinner. Pavlov is associated with Classical Conditioning, which is the pairing of stimulus to produce an unintentional effect (remember the salivating dogs?). 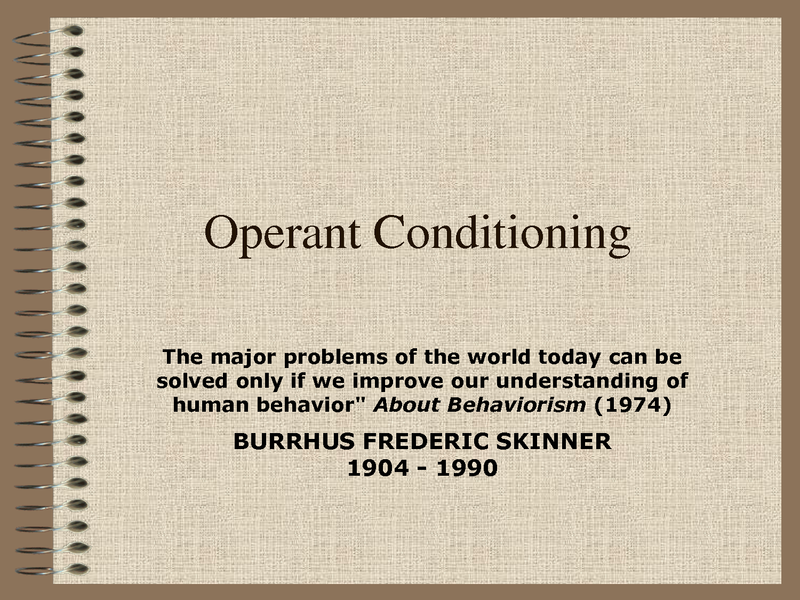 Skinner is associated with Operant Conditioning. Operant conditioning is using reinforcement or rewards to strengthen behaviors, and removing that reinforcement to weaken behaviors. 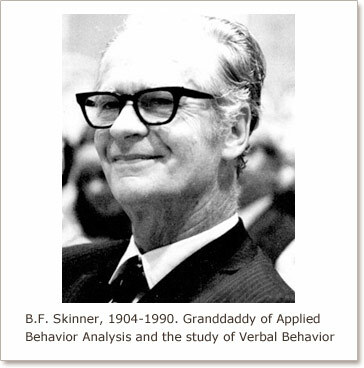 The field of ABA stands on the amazing work of B.F. Skinner and his theories, which is why ABA is such an impressive treatment method. ABA has decades of research behind it, in literally thousands of settings, with all kinds of behaviors. ABA therapy as a treatment method is based on Operant Conditioning, extensive research studies, and the science of behavior. If an ABA program is done ethically and correctly, then amazing progress is possible. The best way to understand an organism is by its behavior: ABA focuses on behavior and not feelings or thoughts, because behavior is observable. Behavior can be quantified, which helps with data collection. Other than medications, there aren’t many ways to change someone’s thoughts or moods (and what happens when the child won’t take the pill anymore?). However to change someone’s behavior, you can use reinforcement, punishment, shaping, environment modifications, prompting, and so much more. Behavior that is reinforced is strengthened, and behavior that isn’t reinforced tends to die out: Why do you answer your phone when it rings? Why do you check your mailbox? Why do you lower your voice when entering a library? It is the response you receive to a behavior that determines if you will continue to engage in the behavior or not. With consistent punishment, you could be taught to stop answering your phone. With consistent reinforcement, you could be taught to shout inside a library. It’s simply a matter of the consequence your behavior receives. The environment is the key to understanding behavior: This is why that student in your class starts screaming and climbing on top of desks when his mom shows up at the end of the day. The environment influences the way we behave, and the environment includes the setting, people, temperature, objects/stimuli, and time of day. If you significantly modify the environment, you will see a significant change in behavior. Behaviors are learned: Behaviors do not “just happen”. Behaviors serve a purpose, and behavior that isn’t reinforced is quickly extinguished. If you sit on a bench in a shopping mall and find a $100 bill stuck to the bench, you are more likely to sit down at that bench again in the future, in the hopes that you will find more money. If you sit down on a bench in a shopping mall and a light fixture falls from the ceiling and hits you on the head, how likely are you to sit on that bench again? All behavior is strengthened or weakened depending on the consequence it receives. Desired reinforcement and internal motivation vary and change over time: If your boss dumps a bunch of extra work on you and then says a very heartfelt “Thanks so much!” afterward, that would probably be very reinforcing the first time. If your boss continued dumping extra work on you, after a while that “Thanks so much!” will stop being reinforcing. That’s because you became satiated, or full, on that type and level of reinforcement. The work output expected of you kept increasing while the reinforcement given to you stayed the same. - The child is given a toy to play with for a few moments, and then the adult takes the toy back. The child begins to scream. The adult ignores the screaming. The child begins to wail, drops to the floor, and kicks his legs. The adult holds up an index card that says “My Turn” and prompts the child to touch the card. As soon as the child touches the card, the adult gives the toy back. Did you see what happened there? The adult changed the situation so that tantrumming became a high effort behavior and communicating using a card became a low effort behavior. As long as the adult continues to reinforce appropriate communication, screaming will be extinguished. 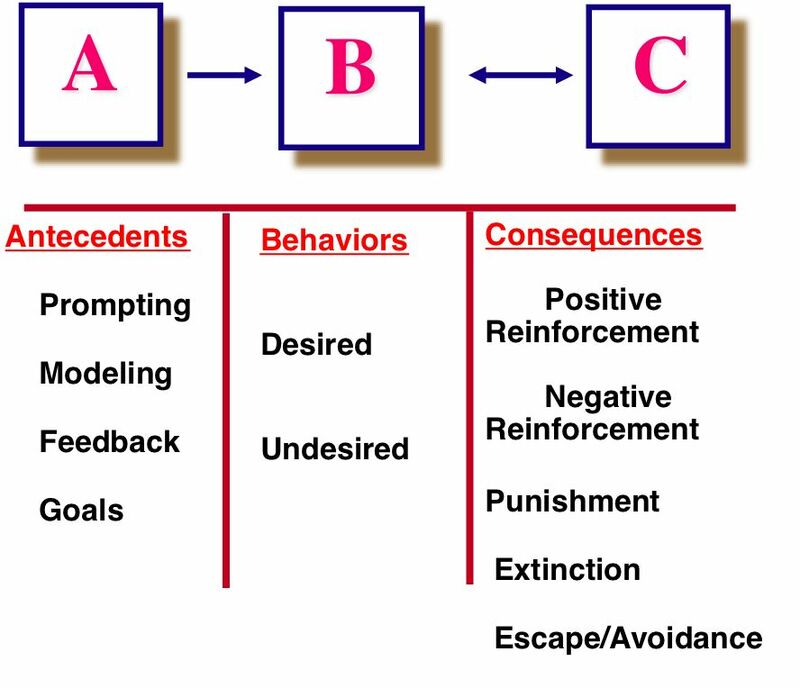 ABA is an ongoing and fluid process of manipulating the environment based on a solid understanding of Operant Conditioning in order to strengthen or weaken behavior. ABA makes specific behaviors seem really rewarding to a child, or really pointless. i am a teacher in a private school where a private consultant was called in by a parent in an effort to reshape a student's behavior. i was very interested to know exactly the mechanism of what this professional is doing. your explanation was very clear.thanks. Im glad you found the post informative! I like the way you explain operant conditioning. Thank you for your post.